One of New Zealand's leading domestic cricket coaches has resigned suddenly following an investigation into his communications with at least one player. Christie van Dyk, head coach of the all-conquering Wellington Blaze women's team, resigned on Friday. His tenure was less than two years but included back-to-back domestic T20 titles. A well-placed source told the Herald Van Dyk "resigned after some sort of investigation", which was understood to have involved electronic communication sent to players. This was not confirmed by van Dyk or Cricket Wellington. In a game of communications gymnastics, Wellington CEO and chairwoman, Cam Mitchell and Sally Morrison respectively, referred comment to Cricket Wellington spokesperson Eddy Bramley. Bramley, in turn, refused to comment, referring inquiries to van Dyk, who did not return numerous texts or calls. Asked specifically if text messages were involved, Bramley reiterated the no comment stance but noted it was the "first time I have heard that". A source who was not authorised to comment on the situation believed van Dyk's resignation was the result of an "overreaction" on all sides. Van Dyk replaced Matthew Bell as Blaze coach in July 2017 after previously being the Director of Cricket at Scots College in Wellington. At the time of his appointment, Cricket Wellington credited van Dyk with playing a big part in developing the careers of Black Caps Luke Woodcock, James Franklin and Grant Elliott. 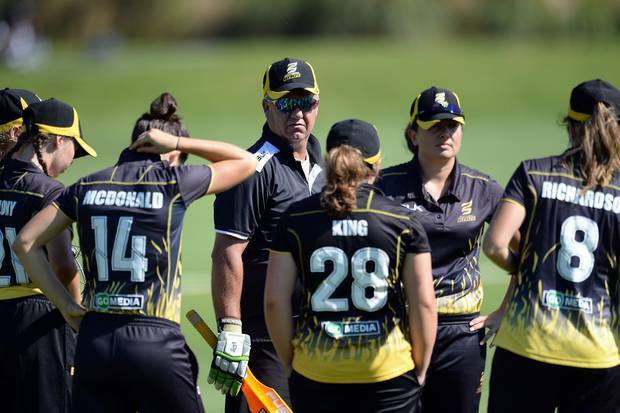 The Blaze feature some of New Zealand cricket's top women's players, including Sophie Devine, Amelia Kerr, and Liz Perry. Under van Dyk's guidance, the Blaze won back-to-back Super Smash titles, beating the Canterbury Magicians by four wickets in last month's final. Van Dyk is also the husband of Silver Ferns great and TV commentator Irene van Dyk. The netballer was appointed as Blaze team manager shortly after her husband took over the coaching duties. In December last year, she told Newshub her job involved organising players' schedules and looking after their welfare. "At first, I was like, 'Well, I don't know anything about cricket', but then I realised I don't need to know anything about cricket, because I'm here for the girls," van Dyk said.